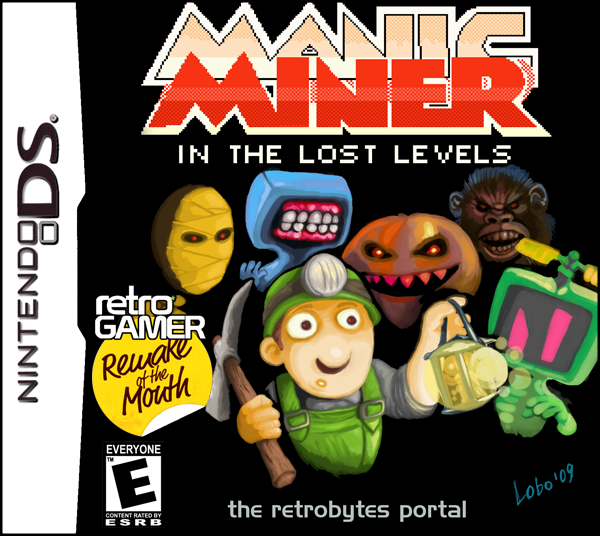 Welcome to Manic Miner - The Lost Levels! Copy the .NDS file to the root of your memory card. It's recommended to launch the game directly from the card's normal menu, rather than through secondary interfaces like Moonshell. The game will run on most cards, but if there are problems, always try the card's latest firmware prior to posting a problem on the forum. For example, with the DSTT you'll need at least firmware 1.17a07. The game also runs well under emulation, and we recommend NO$GBA which offers a good compromise between speed, compatibility, and audio, though you will need the NDS BIOS ROMs. We cannot provide these, but Google should find them for you. (The filenames should be BIOSNDS7.ROM and BIOSNDS9.ROM.) Better yet, use NOZ, which is a "wrapper" for NO$GBA which also enables bigger display sizes. Also, setting the 'GBA Mode' in options to 'Poppy Bright' will cure the washed out palette (remember to save options). DeSmuME is another decent emulator which runs MM:TLL nicely, and which doesn't require the BIOS ROMs. At the time of writing it has a minor issue in that the two screens are initially the wrong way round (the game is still fully playable in this mode), but creating and then loading a save state seems to fix the problem. iDeaS will also run the game under emulation without requiring the ROMs, though audio will be compromised. Remember - nothing beats playing the game on real DS hardware! Collect all the flashing objects to open the door and escape each stage. Beware enemies, conveyor belts, sharp objects, crumbling floors and long falls. Flip switches to alter various aspects of the stage. 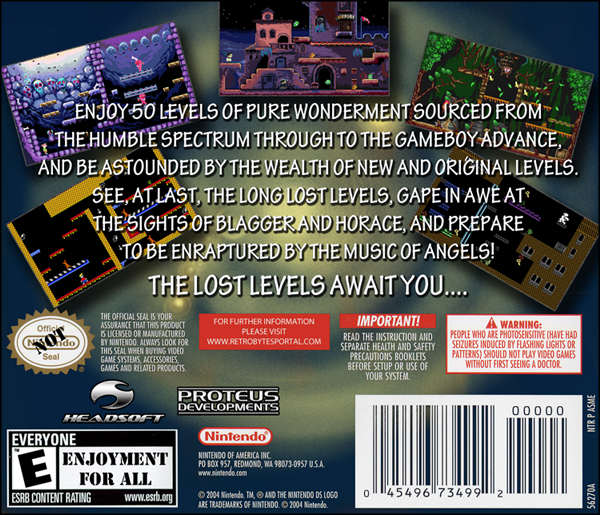 The game contains 50 levels, arranged in three sections. The Lost Levels are 20 stages taken from genuine Manic Miner ports. They're levels which didn't appear in the original ZX Spectrum version of the game, but were added to subsequent official ports for such platforms as the Oric, BBC Micro, Dragon 32, Amstrad CPC and Game Boy Advance, sometimes as additions to existing levels and sometimes as replacements. 20 of these stages* were first compiled and ordered into a notional sequel by Stuart Campbell (in 2004, on his website World Of Stuart), which eventually became the subject of a feature in Retro Gamer magazine in 2009 before being turned into the reality you're now reading about. Unlocked on completion of The Lost Levels, Willywood is a standalone 10-level game featuring original stages designed by the authors of this game. The 20 bonus stages are a mixture of original levels and classic levels from both Manic Miner and other related games. They're played for speed rather than points (each keeps a record of your fastest time), and are unlocked one at a time, by finding secret areas in stages of The Lost Levels and Willywood. 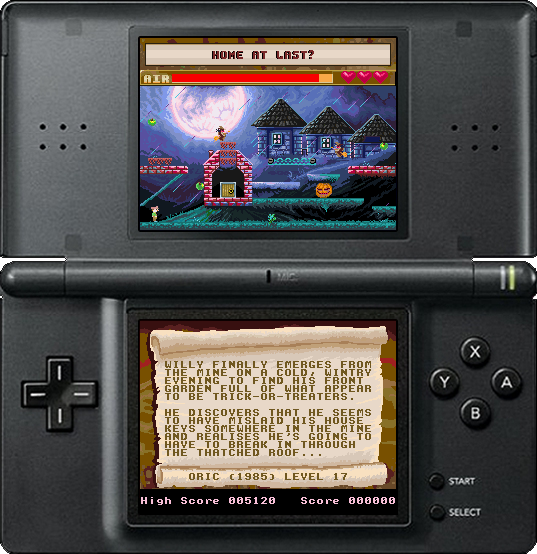 If a level has a secret area to find, a small seal will appear at the top right corner of the descriptive scroll which occupies the DS' second screen. On finding the area (you'll know when you've done it) a new bonus level will be unlocked. You don't have to complete the level after finding the secret area, just getting there is enough. The save system works by saving game data either when a new level is found or when a level is unlocked, and also on the game returning to the title screen, so do not turn your DS off during these times. v1.04 - Fix to minor title screen corruption when all modes are unlocked. v1.05 - Tune added, Score modification for WillyWood, Small tweaks. v1.06 - Fix to Save bug. Miner Willy was created by Matthew Smith, to whom we send love. Wintermute for devkitARM, Chishm for libfat, Martin Koth for DSTek & No$GBA, Eris & Noda for EFS / NitroFS. Also thanks go to LiraNuna, Blasty, Cearn, Dovoto, Joat, Dekutree, Elhobbs, Ruben, SimonB, DarkCloud and everyone on gbadev.org.